I think there is this Idea that all ones ideas should be these isolated Icebergs of immaculate beauty and artistic clarity. I wish it was like that. I am a lot simpler than that. Im more of a creative plumber than anything else. A lot of my computertime nowadays seems to be spent chatting away aimlessly with either Ketil (Vestrum Einarsen) or Jacob (Holm-lupo) in Norway. We bounce ideas and snippets of songs. Trying to figure out where we are going with his whole music thing. The other day Jacob sent me a link to the first UK album. I hadnt heard it since the early 90s. I was surprised to hear how extremely dated it sounded. Bill Bruford was doing his early rototom stuff and it just had that weird feel and sound to it. Another thing that is really interesting about Rototoms is that sound pretty awful acoustically but record really well...When recording ideas for Ketils album Im letting all of these influences, sounds and ideas bleed in. Ive consciously broken up my playing using very few cymbals. I very seldom hit single hits on the snare drum and I avoid the 2 & 4. This opens up for using small tight drums that cut thru and are tonal and sharp....remembering my conversation with Jacob about UK I decided to get rid of the Hihat and throw in a 12" Rototom there instead. I do all the 8 note stuff with shakers and tambourines instead so that it can be edited sharper for effect. Yesterday I recorded the drums for the third track on the album...weirdly enough called #3 for the timebeing. I started thinking about my childhood and the drummers I liked and as a kid I loved Duran Duran. 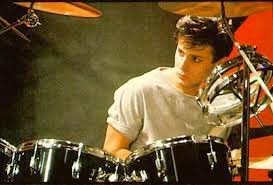 Roger Taylor was my favorite drummer. He always looked like he was struggling. But always overdubbed these cool accents on rototoms. One of my childhood heroes with a rototom. The track starts with a really quiet opening section so I decided to do something extreme for a prog song....played brushes. I love the sound even though I am always struggling when recording. It has to have that feel. 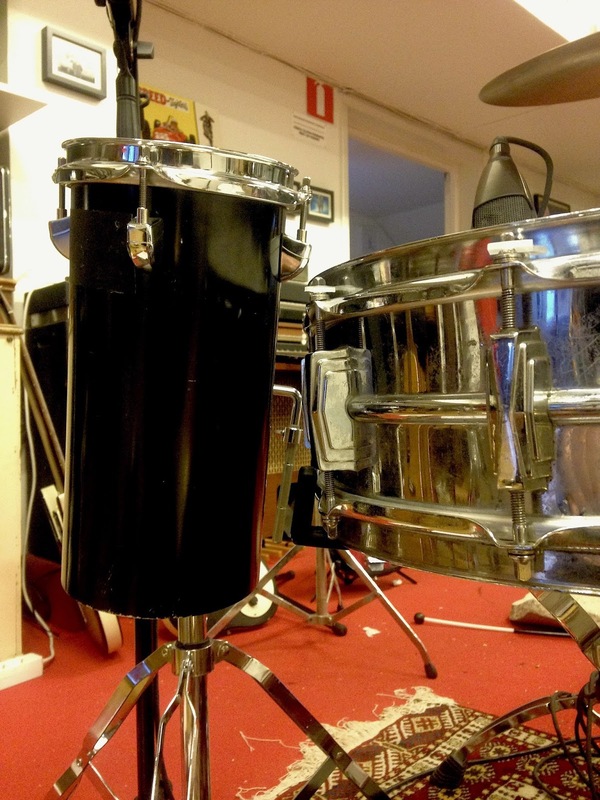 Then I started thinking of another of my favorite drummers Stewart Copeland and brought out one of my Octobans and built the 16th note rhythms around that configuration. 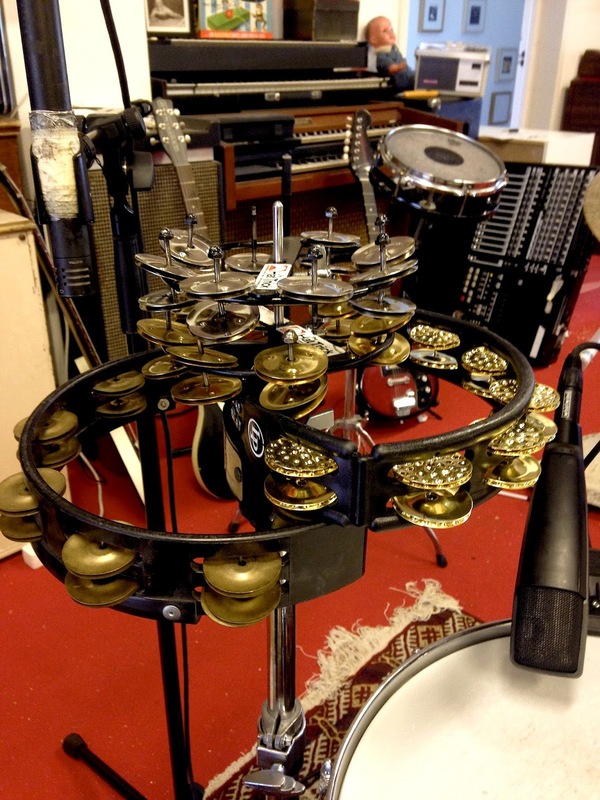 As I am avoiding the snare on the 2 and 4 I built a sort of tambourine pile on the hihat stand that plays that part. So it all came from hearing a bit of UK and thinking about what drummers I liked as a kid. Today Ill be working on a new Tom Doncourt track and the Akaba album will be mastered at Cutting room.